My experiences doing the zoo teen program at Potter Park Zoo had a great impact on me. It helped me to venture out of my comfort zone a little, and also interact with new people (and animals of course). My first year I was a teen volunteer and it was a great start to get me going with the program. Sometimes I have trouble socializing, but on slower days when you only give three pony rides per hour, there’s not much else to do besides cleaning and talking with the seasonal worker you’re scheduled to work with. The setting was for the most part a very calm, open one which I felt comfortable in. (Even the time I was running a little late because I got lost on my first time driving to the zoo!) This was a great experience learning from the staff and how many of them are working towards an animal related career, or also getting advice from someone who’s been through high school and part way through college. The next year I had graduated to the position of Junior Zookeeper. In order to gain my necessary hours of volunteering, I would still have to work the same areas as a teen volunteer, but I was also allowed to do job shadows with the zookeepers. One thing I think most people don’t realize about being a zookeeper is how much cleaning you have to do. It seemed like when we weren’t feeding the animals, we were cleaning their enclosures. One of my most memorable experiences was when we had to train the North American porcupine, Doug. I learned a lot about how to properly condition an animal to perform a task, and even applied the technique to some of my animals at home. 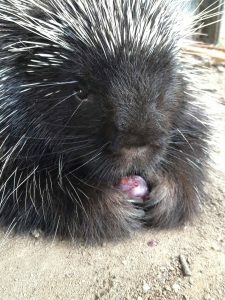 I was a little nervous based on the whole stigma against them (even though I knew they couldn’t shoot their quills), but I learned that it was not the case. I also had to clean the enclosure for the Reeve’s muntjac during one of my other keeper shadows. I was a little nervous as well because with most of the other enclosures we cleaned the animals were locked out, but I was told to go in with him. He would come right up to me and watch me while I cleaned, and seemed to have no fear towards humans. He would sniff me with his little wet nose, and even licked my hand while I was trying to rake the exhibit. I could go on for quite a while talking about the many great experiences I’ve had! The one regret that I do have about it is that I wish I could’ve started earlier so I would be able to do it longer. 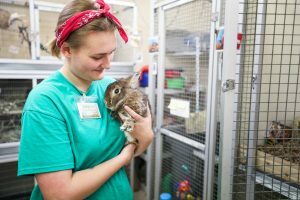 Do you know someone interested in becoming a Zoo Teen? Applications close on April 10, 2019.